New data shows companies use social marketing for branding, and then struggle to measure the return. Here’s how to gauge long-term success. Virtually every brand has a social presence, but gauging success is often difficult. New research from Simply Measured shows that 60 percent of companies struggle to measure the ROI of their social media marketing. Does your company have social-savvy goals and plans, or could you be at risk of wasting time and resources by operating with the wrong expectations? 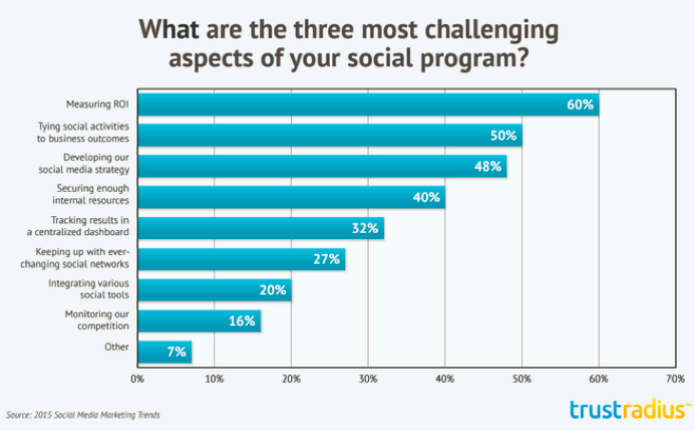 What Do Marketers Want from Their Social Campaign? 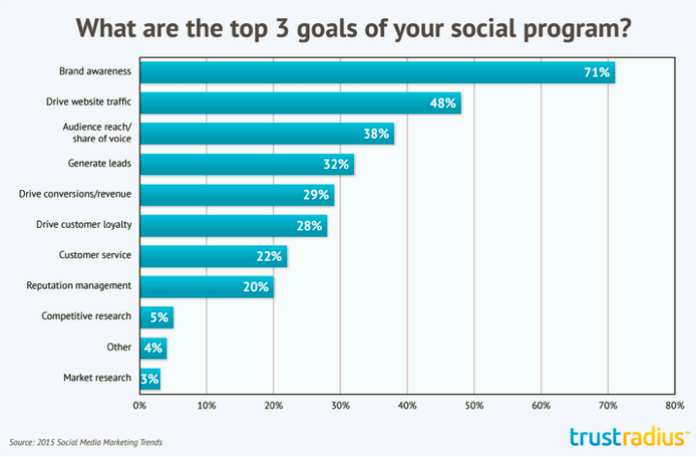 Marketers cite branding over sales as a social goal. Most companies use social media marketing to establish solid brand awareness. In fact, Forbes lists “brand recognition” as the top benefit of social media for marketers. Of the companies that Simply Measured studied this year, 71 percent chose “brand awareness” as their top goal. The top three goals of expanding awareness, traffic, and reach tower over the next most commonly reported bottom line goals of generating leads and driving revenue (cited by just 32 percent and 29 percent of marketers, respectively, as social media priorities). While driving traffic to a website might seem like an appealing goal, traffic is arguably a key performance indicator of brand awareness. When website traffic, a top goal for 48 percent of social programs, is defined as success, rather than a mark of success, a potential incompatibility exists between social media goals and business expectations. How Can You Know Whether Your Social Media is Effective? ROI can be long term. While marketers agree that patiently, strategically acquired brand awareness through social media is important, many companies say their biggest social media challenge is measuring tangible, financial results. The top challenges suggest a disconnect between many companies’ stated goals and their desired results. In fact, 60 percent of companies report that measuring ROI is their biggest challenge, and 50 percent report that tying social media to business outcomes is a leading concern. The challenge likely arises because the relationship between brand awareness and bottom-line business results is often indirect, with no clear line in a marketing attribution funnel. Even for high-ticket items like TVs, ROI is usually easier to gauge from B2C social data than from B2B data, where brands typically deal with longer buying cycles. B2B ROI stems significantly more from general brand awareness than from anything else. So how can companies connect the dots between their goal of branding, and the business outcomes? Since the value of your social presence can be vague, Brafton’s social analysts suggest setting a custom goal. Sumit says: “Define your own value of a social media ‘conversion’ specific to your business.” – a unit through which you can extrapolate value. Each Twitter click can be estimated as worth 20 cents. These custom conversion values will depend on your brand’s audience size, services’ costs, and expenses used for marketing, but will help to give you defined cash values of your social marketing results. What KPIs Should You Look For? Here are some core metrics Brafton’s social media analysts recommend to judge B2B and B2C performance. How much conversion traffic comes from social? Is it qualified traffic with a lower bounce rate? Is it engaged traffic with more pages per visit? Do sales correlate with what is featured on social media? Correlation between demographics of fans or followers and website buyers? Correlation between timing of social promotions and website sales? For the harder-to-grasp B2B social ROI, look for other indicators of how brand awareness is growing, and how social fans’ behavior correlates with buyer behaviors. How is social spreading the brand name? Influencer interactions through shares or retweets? Share of voice, via the percentage of all online content about your brand, relative to competitors. What activities are social users taking, relative to the “long-term conversion units” you’ve outlined? While Simply Measured’s report highlights the challenge of tying brand-building programs on social to bottom-line business value, it also reveals marketers have no plans of slowing down. 70% of marketers have invested more in social media this year than last year. For a look at the most popular social platforms to reach online customers, check out research on network adoption rates. Ben Silverman is Brafton's Marketing Writer. His writing experience dates back to his time reviewing music for The UMass Daily Collegian at UMass Amherst. Ben joined Brafton with a background in marketing in the classical and jazz industries. When he's not writing, he's playing drums, guitar, or basketball.